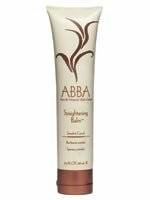 ABBA Straightening Balm 5.1 0z. DISCONTINUED. Sensationally smooth. Lemongrass, rosehips and comfrey work together to surround and smooth the hair shaft. Straighten, control and improve manageability with this balanced versatile formulation. Notify me of updates to ABBA Straightening Balm 5.1 0z.